When El Chavo restaurant and its neighboring sister bar El Chavito closed months ago, things were left in limbo until a trio of big names in the food and cocktail world decided to reopen the restaurant and bar as a months-long pop-up. While some things have changed in the interim, one thing remains the same: an awesome daily happy hour. 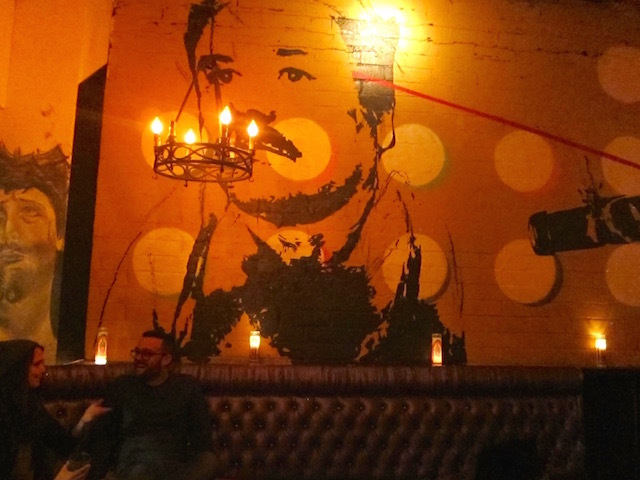 In its rebirth, the "El" in the bar&apos;s name has been dropped to just "Chavito." This pop-up is helmed by Ceviche Project&apos;s Octavio Olivas, Scarpetta&apos;s Executive Chef Freddy Vargas and Cocktail Academy’s Brandyn Tepper. For El Chavo, think fresh ceviche, a raw bar, tequila and mezcal; Chavito is the more laid-back sibling with classics like margaritas, quesadillas and tacos. What we remember most about the old Chavito, which sits on the border of Los Feliz and Silver Lake, was its stellar happy hour deal, where you could get cans of beer for $3 and tacos that cost a couple of bucks and hang out at the bar next to a shrine of Dolly Parton. We&apos;re happy to report that they still have some of those deals, but made with higher-quality ingredients. 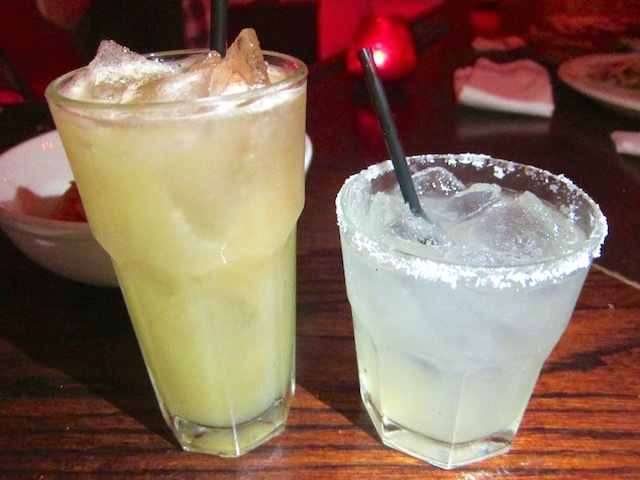 LAist was invited to check out Chavito&apos;s happy hour, which runs every day from 5 to 7 p.m., and found that they&apos;re still offering $3 cans of beer: Tecate and Modelo Especial, specifically. As for cocktails, you can still get a $5 margarita, but in addition to that, a Moscow mule and old fashioned for the same price as well. Cocktail Academy&apos;s Matthew Landes tells LAist what makes their drinks different from the old spot is that they use fresh juices (that they squeeze daily), don&apos;t pre-batch the cocktails, and make each drink by hand. It might take a bit longer, but it&apos;s definitely fresher and tastier. "Chavito is all about giving to the neighborhood what they want," Landes says. "We are introducing a different taking on classics." In tradition with the old restaurant and bar, Chavito is still serving $5 Banderas—a trio of shots, lime and sangrita—which is a secret recipe Olivas has been perfecting over the years. The sangrita recipe, which includes ingredients like orange, lime and chili, is so secret that only Olivas makes the sangrita for the whole establishment, Landes says. 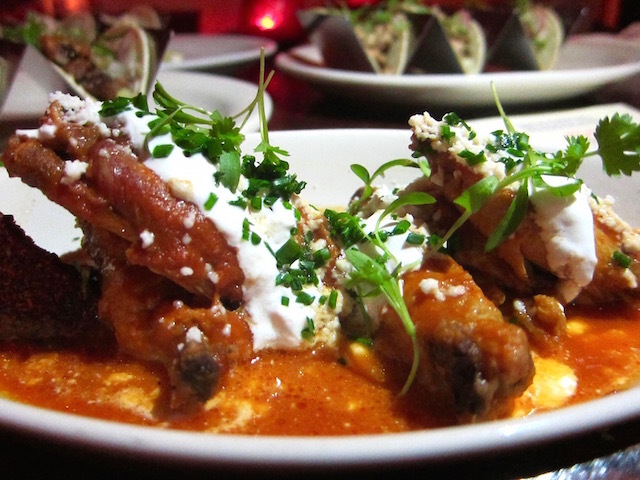 As for food on the happy hour menu, you can find $5 "Tinga" chicken wings, and short rib quesadilla with a smoky salsa di arbol. Other items you might find on Chavito&apos;s all-day regular menu are $8 guacamole with crispy pig ears, nachos, and zucchini flower rellano. However, on the night I went, Chavito was also serving three kinds of large tacos (potato, chicken and short rib), which you could get 3 for $8. Since Chavito and El Chavo are joined at the hip, you might as well walk over and check out the restaurant portion. It&apos;s a little more expensive for dinner, but here, you can get some of the most beautiful presentations of ceviche you&apos;ll like ever see, like this one pictured above that was made with Santa Barbara ridgeback prawns, avocado, habanero salsa and cilantro flower. (The ceviche was also offered in Chavito when I visited.) Olivas hand selects the seafood and even drives out to areas like Santa Barbara himself to pick it up. 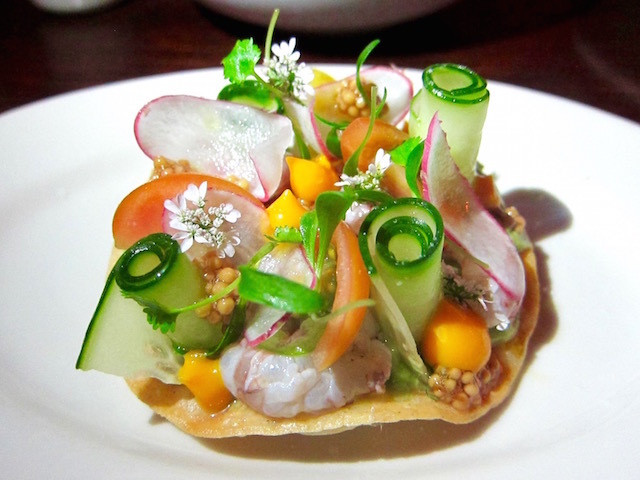 "Basically I&apos;ve been doing a pop-up for four years and picked my favorite ceviches [for El Chavo]," Olivas tells LAist. El Chavo also offers a happy hour special daily from 5 to 7 p.m. where you can get a Bandera, three raw oysters and a beer, all for $10. Not bad. On another note, Landes opened my eyes to a little secret order you can make. If you get a Bandera (splurge and ask for mezcal), you can ask for a fried cricket (that&apos;s not on the menu) to go along with that. The Bandera comes out in three tiny clay jugs. 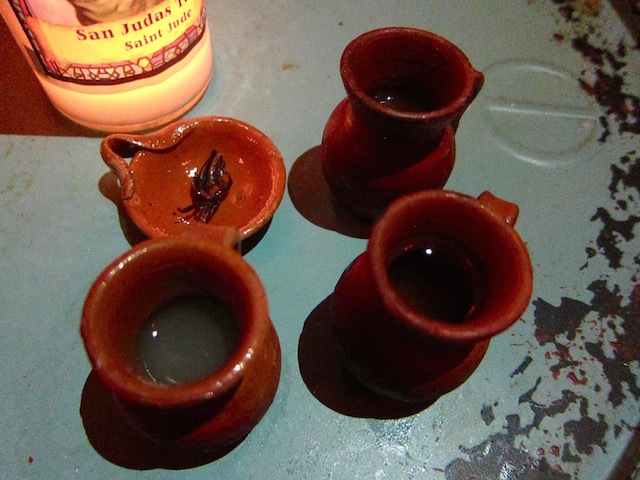 Sip the mezcal, then the sangrita, eat the fried cricket, and then sip on the lime juice. It was my first time eating cricket, and it turns out that I like the savory and salty taste of the cricket! It all goes well together with the Bandera. 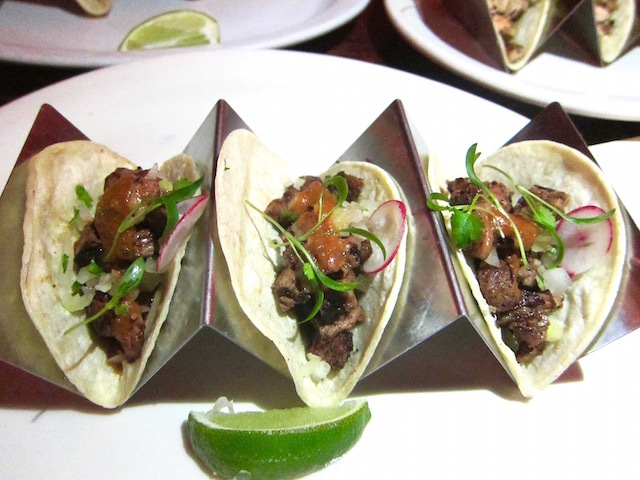 When you walk through Chavito, you&apos;ll notice that it looks different from its former self. The walls are filled with artwork from street artists, from a mural of Pablo Escobar to one of a girl wearing a sombrero taking a shot (great for Instagram if you want to take a photo saying cheers with her). 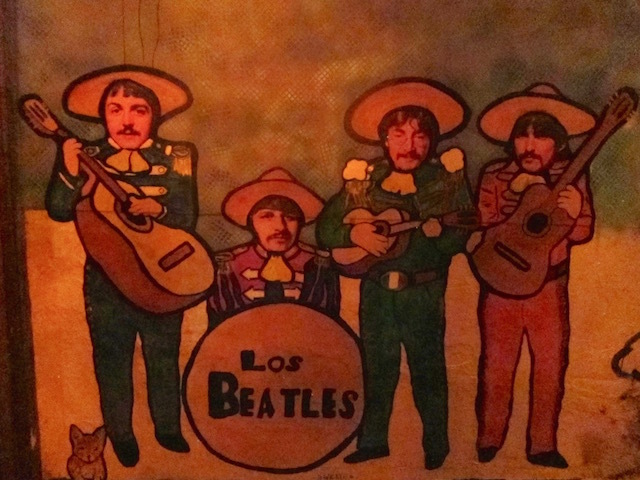 One of my favorites is the "Los Beatles" mural, with John, Paul, George and Ringo wearing sombreros. Landes says the work was curated by The Most Famous Artist, and he brought in several artists to decorate the walls. Prayer candles line the walls of Chavito, too, and the bar is just about as dim as it used to be. "When it came to Chavito, it was always a hidden dive bar in Los Feliz, a secret little sister to El Chavo," Landes says. "We&apos;re putting more personality into it." While I do miss the now-gone Dolly Parton portrait and the extra-divey charm of its former self, I do like how Chavito can still be a relatively affordable neighborhood spot. You&apos;re getting higher quality ingredients for about the same price in a hip, and still laid-back location. As for how long you can expect this El Chavo and Chavito pop-up to be around, Olivas says it&apos;ll hopefully stay until the end of summer, so you have a few more months to check it out. El Chavo and Chavito are located at 4441 W. Sunset Blvd., Los Feliz, (323) 664-0871.